Thousands of people are expected in Stratford-upon-Avon later this month for a bumper weekend of family fun at the last Shakespeare Birthday Celebrations before next year’s 450th birthday anniversary. Jubilant flag-waving crowds will line the streets of the Elizabethan market town as actors, foreign diplomats and civic dignitaries join a 1,000-strong parade through the streets on April 20 as the town – and the world – pays tribute to the Stratford-born playwright. There will be music, street entertainers, acting and theatre make-up workshops, tours of the Shakespeare houses, children’s parties – and the chance to spot the occasional famous actor. With the 450th anniversary of Shakespeare’s birth next year, and the 400th anniversary of his death in only three years’ time, the eyes of the world will be fixed on Stratford. The town has been celebrating Shakespeare’s birthday since 1824; celebrations that always begin with the grand procession of VIPs, actors, scholars, characters in costume, bands, strolling players, and local schoolchildren and townspeople. Since 1893, the boys of Shakespeare’s old grammar school King Edward VI School (K.E.S.) have led the procession to Holy Trinity Church, and make a memorable spectacle as they parade through Bridge Street following the traditional unfurling of the flags of nations ceremony at 11.00am. Whilst the procession gets into position for the flag unfurling ceremony, the ‘Quill Pageant’ will take place outside Shakespeare’s Birthplace, where costume character William Shakespeare will ceremoniously hand over ‘The Quill’ to the head boy of K.E.S. who will use it to signal the start of the flag unfurling ceremony and will then carry it all the way to Holy Trinity Church, symbolising Shakespeare’s journey from the cradle to the grave (he was both born and died on the date April 23). Immediately following the main parade will be the Community Procession and street entertainers, with the Stratford Morris Men bringing up the rear. Local people and visitors are invited to join in and walk through the town with floral tributes for the grave. On the same day the Royal Shakespeare Company (RSC) will be launching ‘In Stitches’, a free exhibition displaying some 35 Shakespearean costumes worn by some of the RSC’s best known actors, such as Dame Judi Dench, Sir Ian McKellen, Dame Peggy Ashcroft and David Tennant. The RSC will also be running a range of free activities, including storytelling sessions, stage fighting workshops and the chance to see how fake scars and bruises are created. Visitors will also be able to go on theatre tours, enjoy music in the foyer areas, explore the new Theatre Tower and, for 50p, cross the river on the ferry, listening to RSC actors reading sonnets. The Shakespeare Birthplace Trust, which welcomes visitors all year round, will be offering free entry at its five Shakespeare houses and gardens to people living within Stratford’s CV37 postcode area. 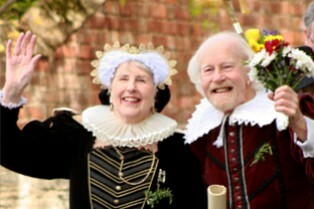 There will be live acting in the Shakespeare Marathon in the Birthplace (where members of the public can have a go at the balcony scene from Romeo and Juliet and have it filmed for YouTube and facebook); a toddlers’ party in Hall’s Croft; story writing in Nash’s House & New Place; and Tudor games, acting and live music at William’s Birthday Party at Mary Arden’s Farm. The town’s hotels, restaurants and cafes will also be playing their part, with some 20 establishments offering special ‘Birthday Celebrations’ themed meals and drinks. The official festivities will end on the Sunday with the annual Shakespeare Service at Holy Trinity Church, where civic dignitaries and members of the RSC will be among the congregation.